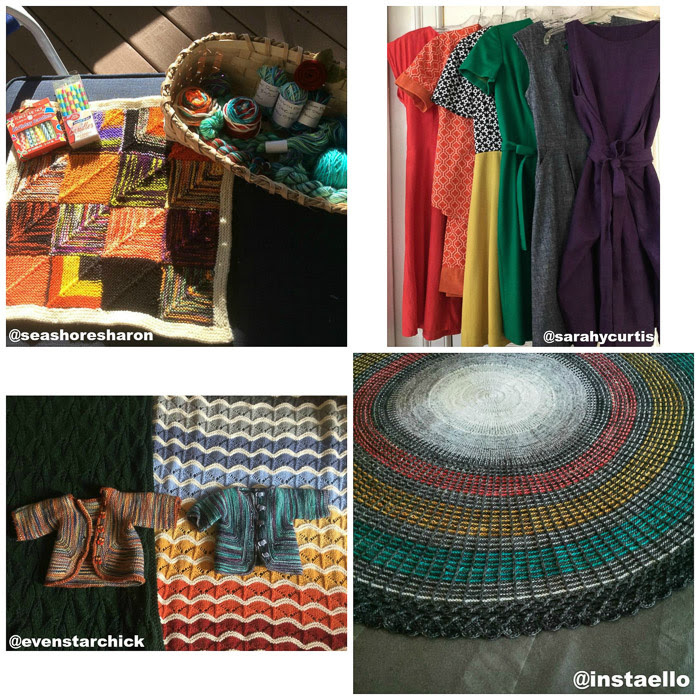 The Fall #CraftyBlissChallenge that Julie (of Knitted Bliss) and I hosted on Instagram ended two weekends ago. It always makes me sad when a challenge ends because I love scrolling through the feed and seeing how other people interpreted the prompts; I love watching a sub-community within Instagram form and seeing participants compliment and encourage one another. I also like how the challenge forces me to see the every day a little differently. True, I can remind myself to do such a thing on a daily basis but when you don't have that little extra pressure from say, a challenge, it's just as easy to let the notion slide. And slide. And slide. And before you know it the sentiment is over and long forgotten. I love how inspired I get and wish I could bottle that inspiration and motivation that I get during a challenge. I'm sure I'm not the only one, as several participants shared extra photos post-challenge! Before I continue on, I would like to say a massive "thank you!!" to all of the people who participated in the challenge, whether you managed to complete all ten days or not. It was so awesome to see so many names that I recognized from past challenges and to see quite a few new ones who had joined after seeing a re-post of the prompts via a friend. Julie and I were pretty excited to discover that 117 people had finished the challenge from start to finish!! I was actually quite surprised with myself with how easy I found this round of prompts were for me. I think the only prompt that made me think twice was the first one, Something That Makes You Happy. 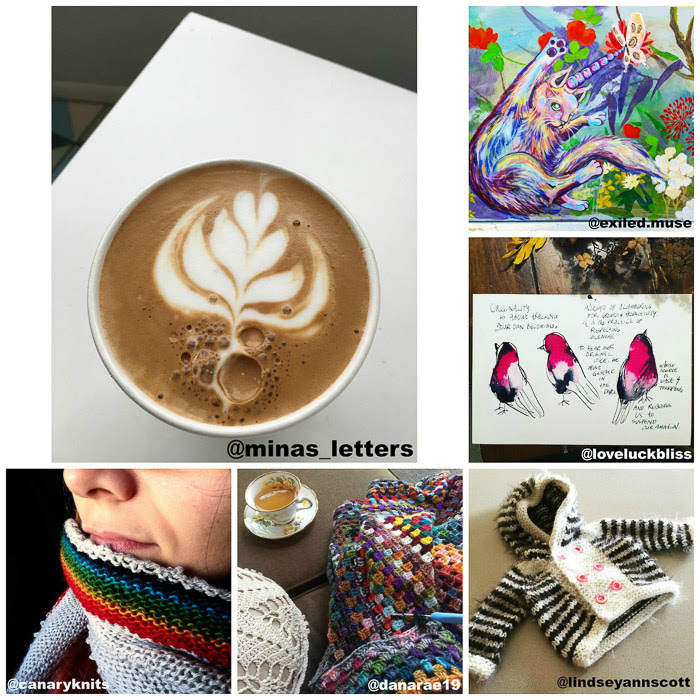 There are so many things that make me happy and since my Instagram showcases mainly knitting and yarn it felt only natural to photograph just that. But then I thought, isn't that the expected route that people would anticipate for me to make? So I dug a little deeper and turned it into a non-craft related post that was slightly cheesy but was downright to the heart (it was about my kiddo and how far he has come since his toddler years in regards to his ASD diagnosis, in case you were wondering). Out of all the photos I took and shared, my favourite has to be the one I took for Look Up. I'm fortunate that I live in a very beautiful city but on that particular day it was grey, rainy, and gross. I waited it out and hoped that the weather would get nicer as the day wore on and lo and behold while walking to the Kiddo's school the rain stopped! In that moment I was passing by the BC Legislature building, which is my most favourite building in the city that I always marvel at, and quickly pulled out my sunglasses and captured through them the view I see on a daily basis (it's the second photo from the right at the bottom of the above collage). I'm really proud of that photo! To this day I wonder whatever possessed and inspired me to take that image, and how do I get that kind of inspiration back! 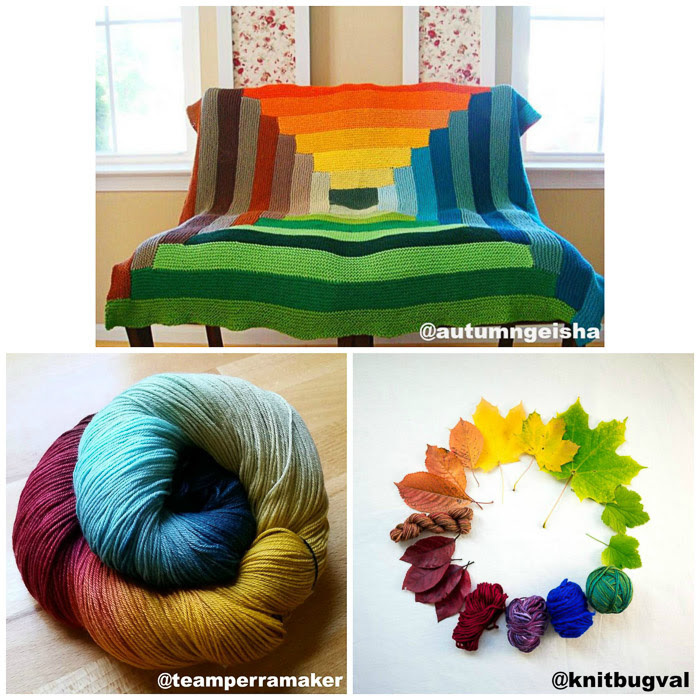 I have always admired that knitted rainbow log cabin blanket made by @autumngeisha. 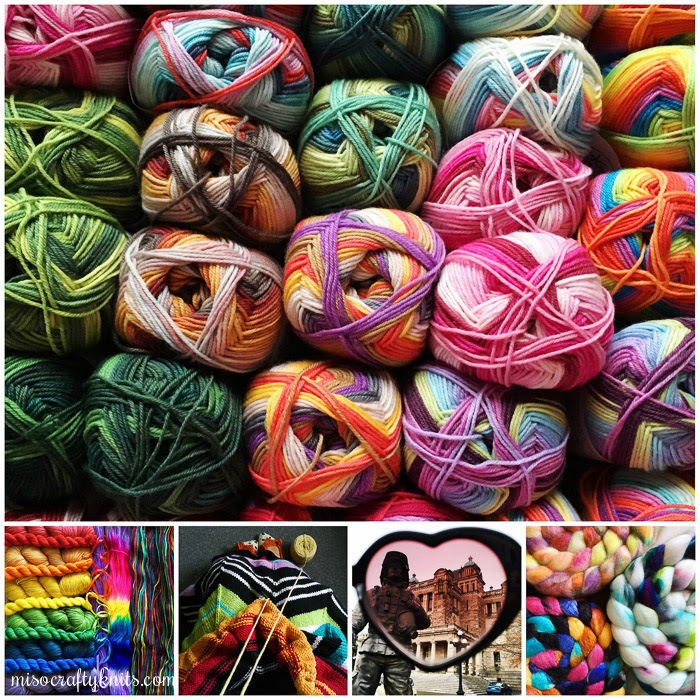 It's just SO stunning, as is the rest of her Instagram feed and her Ravelry project page! I'm definitely inspired to start collecting yarn to knit myself one...eventually. Or aspire to make, like @danarae19's crocheted scrappy Granny Square that my own Noro version wishes it could be when it grows up. All the rainbow-y photos just make me so happy and a few of them have such touching stories behind them, like the photo of the two Baby Surprise Jackets on handknit blankets made by @evenstarchick that she made to bring home her babies from the hospital in. I love the contrasts and the mix-and-match feel between the four pieces and the fact that they're knits I can see becoming well-loved family heirlooms that will be passed down from generation to generation. I also really appreciate the non-knitting posts and am always happy that participants don't feel pressured to produce something knitting or yarn related in a predominately knitting community. I have a major soft spot for latte art (actually, @minas_letters has a simply gorgeous feed of knitting, needlework, and foliage), catching glimpses of someone's artwork and progress (@loveluckbliss's paintings are all so beautiful), and for the second challenge in a row @exiled.muse snapped a fun, colourful work of graffiti. And the colours...oh, the colours!! I simply cannot get enough!! For someone who wears a lot of black and grey but wishes they had an exquisite, colourful, handmade wardrobe full of dresses like @sarahycurtis's (seriously, check out those dresses!! ), I truly do like big, bold colours! Whether that colour takes on the form of a skein of yarn that I can't bear to knit up like @teamperramaker's skein of In The Whirled, or the beauty that is given to us by Mother Nature (ok, mixed with yarn too) like @knitbugval's, or knitted into home goods and accessories like @seashoresharon's and @instaello's, or paired with my beloved grey like @canaryknits' scarf, or even as a pop of colour like @lindseyannscott's. All the colours are just screaming out at me. I love it! Another favourite prompt was Rainbows (kind of obvious). That prompt was the perfect one to end the challenge and I hope it made all the participants leave the challenge with a smile on their faces. Again, I wish I could re-post all the photos from that prompt here on the blog, but the one that really stood out and even came with a fantastic tip was by @jesieost that I definitely want to try. Jesie recommended saving and storing those little scraps of yarn by wrapping them around a clothespin and pinching the free end in to keep the yarn from unraveling. Brilliant!! Am I right? 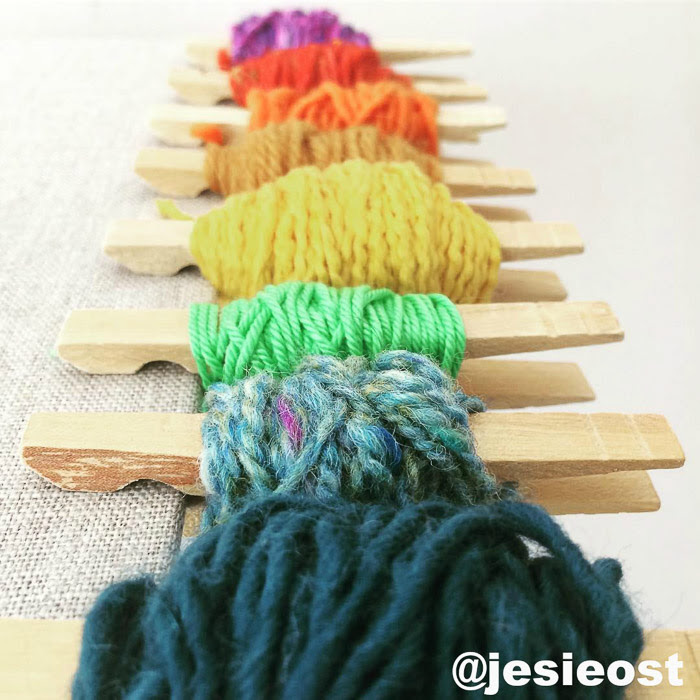 Jesie likes to use these little remains for toy knitting, single stripes, pompoms, embroidering details, and wrapping presents. I think this would also be an excellent way to save a bit of leftover yarns used to knit socks for future darnings or to present within a gift in case the recipient needs to replace a button, do some mending, or whatever. I like to include not only a card that says the fibre content and care but also a wool wash sample with all my gifts, this would make for a lovely bonus too. Thanks Jesie for the awesome tip! If you haven't heard from us already, we will be in touch with you via Instagram direct message! Thank you so much to all of the participants of this Fall challenge!! We hope you had as much fun as we did and that you'll join us again for the next one! And thank you to the participants who gave me their permission to use their photos for this post!! I love participating in these challenges, it breaks me from the standard knitting/baby on lap pictures. Thank you for featuring me on your blog!